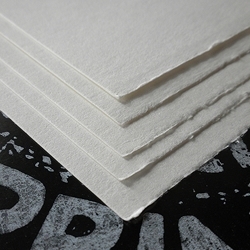 This 100% cotton, archival paper is ideal for a broad array of printmaking applications. Natural white paper is soft, durable and can withstand being soaked prior to printing. It is ideal for all printmaking techniques including relief, lithography, intaglio and screen print. Medium-textured surface features two deckled edges and is acid free. Sheets measure 20x30 inches and are 280 g/m2.